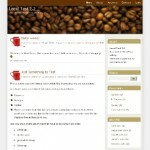 I just spent some time to bring in some of the new features to our original CoffeeSpot Theme. It now has the support for Threaded Comments and Multi-Paged Comments when used with WordPress 2.7 and above. I also made it to be wider than the previous version. Thanks for the update. Since I modified your original slightly, what files do I have to port over? I guess I can diff them all, but you probably know what you changed. Are Gravitars supported? Is the demo at http://wprocks.com/demo/?wptheme=CoffeeSpot using the updated version?